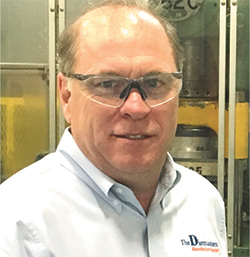 Virgil DeLay, president of Diemasters, credits a restructuring and continued commitment to employee training as important factors for continued sales growth. Diemasters Manufacturing, Inc., Elk Grove Village, IL, is all about embracing change to ensure steady growth. Since receiving the Metalforming Pioneer Award in 2011, the custom stamping, fabrication and automated-assembly company has gone through a restructuring and changed its sales direction, while continuing to shine a light on employee training and productivity. “When it became apparent that the growth potential of Diemasters was beyond our current capital structure, we approached a long-time affiliate and in 2015 became a part of the Weiss-Aug Group,” says President Virgil DeLay. The Weiss-Aug Group is comprised of Weiss-Aug (custom insert injection molding, precision metal stamping and assembly) Weiss-Aug Surgical (medical-device components and subassemblies), JK Tool (production machines and tooling) and Diemasters, where the emphasis is on value-added assemblies comprised of stamped and fabricated parts. Scott Kauth enjoys the challenges that come with being a quality assurance manager at Diemasters and credits the company’s LISSTs training for his success. “By becoming a part of the Weiss-Aug Group, we were able to shift our precision-contract work to Weiss-Aug, which gives us the opportunity to focus on our value-added business, utilizing our productivity and training systems to ensure success,” explains DeLay. “While our sales direction has changed, with some stamped parts now being tooled and produced at Weiss-Aug, our overall sales continue to grow. Octavio Villegas, who recently completed his tool and die apprenticeship after completing Diemasters’ LISSTs training, describes his training as life changing and challenging, recalling long days in the shop and evenings spent studying. 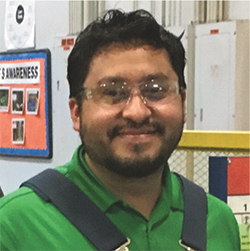 To say that Villegas, who worked in the deburring area and as a material handler and setup technician before becoming a die maker, is bursting with pride may be an understatement. “I work with precision instruments, make my own tools and help others,” he says. “I am an important part of our company; I am a die maker.